Alcoholism is a family disease. It doesn't just affect the person suffering from addiction. The family's dynamic, mental and physical health, finances, and overall stability are negatively impacted by the person's drinking. The home environment is often tense and unpredictable, and family members may either try to deny the drinker's behavior, make excuses for it, or attempt to control or stop it. These are all common responses to a home life that feels like it is spinning out of control. What Can I Do To Get Them to Stop? If your loved one is suffering from addiction, it's natural to wonder how to make them see that they need help. For you to be asking this question, it's likely that your loved one has gotten the point that they continue to drink in spite of obvious problems caused by their drinking. Personal, social and perhaps legal problems that would cause most people to conclude that their drinking habits should be curtailed or eliminated don't typically affect alcoholics in the same way. It's important to understand that this is not a weakness—rather, the drinker is psychologically and physiologically addicted to the substance of alcohol and requires professional help. The challenge to this, as you likely well know, is that many alcoholics are in denial that there is a problem. No matter how obvious the problem seems to those around the alcoholic, the alcohol-dependent person loudly may deny that drinking is the cause of their troubles, and may blame the circumstances or people around them instead. When readers ask how to help the drinker in their lives, the answer they usually receive is, "Unfortunately, there is not much anyone can do, until they admit they have a problem." While it is true that your loved one needs to actively seek sobriety and want to change, you don't have to sit back and watch them self-destruct, just hoping and praying that a light bulb goes off in their head. There are several things you can do to intervene, show your concern and support for your loved one, offer ideas and solutions, present consequences to their continued drinking, and protect yourself from getting too wrapped up in their addiction. The first step for family members and loved ones of the drinker is to learn about the disease of alcoholism. This does two things: It helps you understand your loved one's behavior, and it helps you stop blaming him or her. While the drinker will need to take responsibility for their actions in order to recover, alcoholism is a chronic disease, has understood symptoms, and is often triggered by genes and life circumstances. Above all, getting informed helps you see that your loved one is sick and suffering, not trying to hurt you personally. As their family member, you can attend Al-Anon meetings in your area, or join an online group to learn more about the family disease of alcoholism as well as the emotional and psychological toll it is taking on you. In Al-Anon, family members can learn how to detach from the alcoholic's problems—not the alcoholic—and can find a wealth of Al-Anon literature to read that can help you to find solutions that lead to serenity. You will likely hear your own story in the stories of those who share with the group, creating a sense of solidarity and support. You will also learn more about the unhealthy roles you may be playing in the life of the alcoholic, and whether or not your actions may actually be enabling the alcoholic to continue in their behavior, without you realizing it. Could you be enabling their behavior? This quiz can help you find out. You can also learn more about the illness by visiting the National Institute on Alcohol Abuse and Alcoholism. Given that an alcohol problem is a touchy subject, plan what you're going to say ahead of time. Wait until your loved one is sober and relatively emotionally stable. Make sure you are also feeling calm, as it is important that the drinker doesn't feel attacked or ganged up on. Avoid accusatory language such as, "You'd better get help or insert-consequence." During this first discussion, it's important to show how much you care about your loved one. Be genuine and honest about your concerns, including how their drinking is affecting their health and the family as a whole. 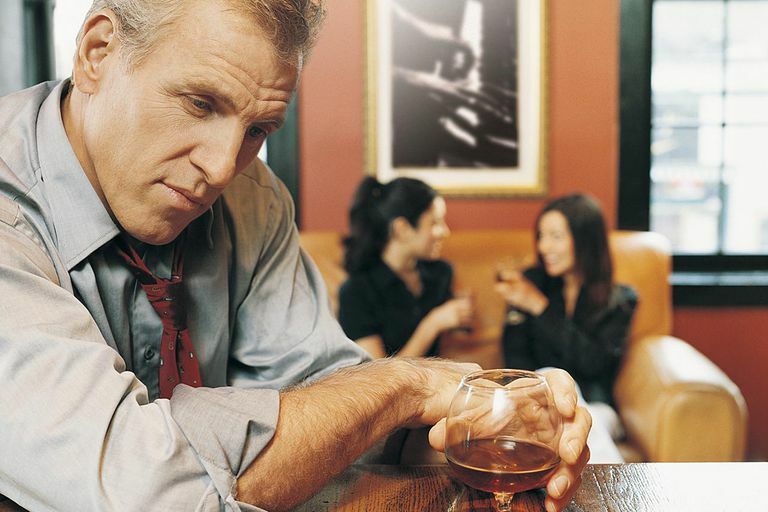 You can mention a particular problem that is arising from the drinking, such as financial or relationship troubles. Let them know you want to support them in stopping through helping them find a treatment program, such as a 12-step program or a rehab facility, and perhaps taking over some of their responsibilities such as tasks around the house while they are taking time out for recovery. Expect some pushback. The person may be in denial. Or if they aren't, they might suggest that they can quit on their own. This rarely ever works. However, you might discuss a timeframe and when you can expect changed behavior. If this first attempt is not effective, which it often isn't—in fact, even when the drinker is committed to changing, it can take several rounds of treatment before they truly stop—the next step you might take is staging an intervention. A professional counselor or therapist is a great person to bring on during this stage. You might make an appointment with one and bring your loved one, or if they are unwilling, go yourself in order to develop your intervention strategy. An intervention often includes other family members or friends that this person trusts, and consists of presenting treatment facility ideas as well as the consequences of their continued drinking. Consequences might include refusing to pick up the financial or personal messes that the drinker is creating, taking away child visitation rights, spousal separation, or asking them to leave the home until they are ready to begin treatment. As Al-Anon emphasizes, "there is almost no chance that alcoholics will stop drinking as long as people remove all painful consequences for them." Often it's only when the consequences of their drinking become painful enough will they become committed enough to pursue recovery. After you've taken all these measures, remember that you cannot force your loved one into treatment. They have to make that decision themselves. All you can do is present options, offer support, and follow through with the consequences you presented. At the end of the day, the only person you control in this life is you. It's common to become overly focused on the drinker's actions and behavior, and obsessively worried, which takes the focus off your own life and is defined as co-dependency. This is destructive to your own mental and emotional health. A core tenet of Al-Anon is to stop trying to change your loved one and instead turn the focus back on yourself, the only one you can truly change. Remember that even if your loved one does enter treatment and recovery, there will likely be many bumps along the way. When the alcohol is removed, which the person was using as a coping mechanism, deeper issues tend to rise to the surface and must be dealt with. Your loved one will need to continue practicing sobriety, and the changes they go through will likely affect you in ways big and small. That's why it can be helpful for family members to continue attending Al-Anon meetings, where you learn to differentiate between your issues and your loved one's issues, and take responsibility only for your own.